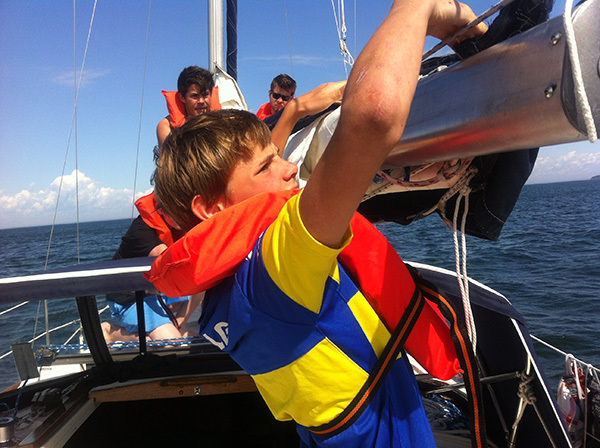 From sailing to hiking to kayak or canoeing trips. Highlands trips teach boys self-confidence, appreciation of the natural world and life skills they will take with them through all the days of their lives. “We put out more trips this week than [other camp that shall remain nameless] does all summer.” –Craig Ericksen, Program Director. Editor’s note: This was said not as a slight on another camp. Craig was just stating a fact! Sometimes I stand back and watch in awe as our Program Director, Craig Ericksen works his magic. It’s no easy feat making camp run as smoothly as it does. Craig keeps track of who is on their day off, who is teaching what activity, who is cleaning the bathrooms, who lifeguards at 4:30 swim, who is working in the kitchen, who is driving out what trips, who is ON trips and where our campers will be scheduled for their activities (keeping their activity requests as a high priority). It takes a special brain to manipulate all that data. So in a week like this one, where we have six senior campers and three staff canoeing the Boundary Waters of Minnesota, eight campers and four staff hiking Isle Royale (from one of the island to the other), seven campers and two staff hiking from one end of Pictured Rocks National Lakeshore to the other, one junior cabin canoeing our local lakes, another hiking the Porcupine Mountains AND four campers and two staff sailing through the Apostle Islands in Lake Superior, I marvel at his wizardry. Did I mention that HE is one of the staff members sailing on Lake Superior? Oh, and tomorrow we’ll send out four more trips! Meanwhile we have those of us in camp fully assigned and cared for, scheduled and covered for a regular day in the life at camp. Why do we inflict this kind of pressure on ourselves? Because we’re Highlands, of course. Our cabins are about as rustic as you can get. We have no screens on our windows, no electricity, and the closest running water is about 20 yards away. Yet these four wooden walls become our second home away from home – and when we hit the trails and the lakes we appreciate even more how little we truly need to be content and cared for. Suddenly our rustic cabins seem like the Ritz! Our tripping program has been part of our fabric since our inception. We believe it is important for our campers to experience the joy and wonder of nature; and learn the skills required to care for themselves and the wilderness around us. That is why we inflict the high level of scheduling madness upon ourselves that we do. Because we believe that the men of Highlands are better men for the wilderness experiences we offer. We believe that the challenges one faces out on the trail are character-shaping opportunities that help prove to ourselves that if we set our minds to something, we can accomplish it. It also happens to be a ton of fun. Thank you, Craig Ericksen, for your ability to help us deliver the Worthwhile experiences we do. What an amazing first week we’ve had! Boys have had so many new and fun experiences. Wednesday was Division Day, (a.k.a. cook’s night off). Boys hang out as a division and have great time. Cubs went on an overnight campout on a local lake. Colts were all out on their 3-day canoe trip. Juniors got to go out of camp to play laser tag and get ice-cream at the Corner Store. Seniors canoed and kayaked en masse all to the way down the lake to Sayner where they ate a picnic supper and played softball in town. 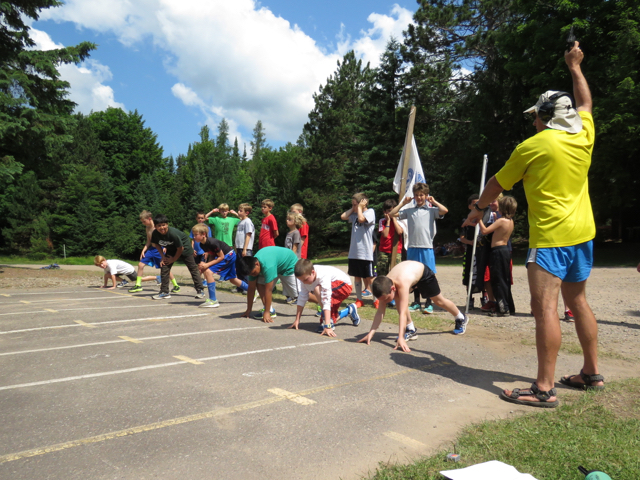 Thursday we surprised the Senior boys by going over to one of our fantastic sister camps, Red Pine for a social. It’s been reported to me that staff waits to break the news to the guys right up until they are about ready to go. Apparently it helps with nerves and cuts down on excessive cologne use (ha!). Many young men have learned to love track at Highlands. Saturday we celebrated our all-camp Track Meet. We had an incredible day. Perfect weather, really, warm and sunny, cool in the shade. Each boy participated in all events and when the points were tallied up, Army was a clear victor. The afternoon brought clubs, where boys could sign up for different activities ranging from slack line to rocket building. The day wrapped up with a picnic on Junior Hill, followed by the world-famous Games on the Hill. I didn’t run in any event, didn’t play any game and I fell into a puddle of exhaustion at the end of the day! Lucky for us Sundays are very mellow around Highlands. 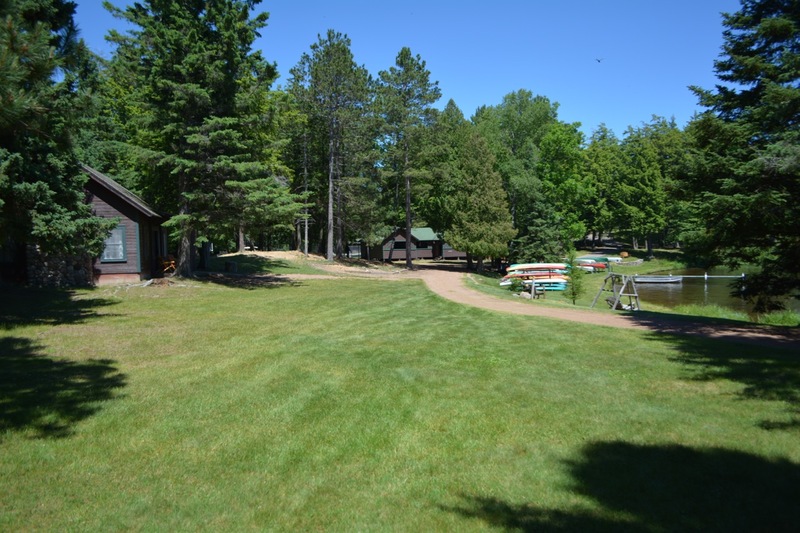 After a delicious breakfast of egg casserole, fruit and cinnamon swirl coffee cake, boys took care of cabin chores, had one activity period and then headed off to soap swim. Boys put on their nice white Highlands t-shirt and headed up to Sunday Assembly. They look so handsome quietly lined up on the Hill before filing into the clubhouse. Assembly is a great time to reflect on the accomplishments of the week. Andy posed the question, “Who tried something new this week?” to the boys and I’d guess 85% of the room stood up. A few boys shared what they tried: Cooper T. shared he tired the adventure ropes course, Drew L. taught lacrosse by himself, Michael C. slalom skied for the first time, Mason W. learned to bridge playing cards (!!) and Tanner S. kayaked for the first time. I’d say the new experiences covered the gamut. Andy talked a good bit about our hula-hoop of safety and how we’ve all had to step out of that hoop slightly this first week of camp. It’s in this next “hard-but-safe-ring” where we are challenged and learn the most. Boys were tasked with three things this week: to continue trying new things, to “be somebody,” (ask your camper about what this means) and to put the other fellow before ourselves. Probably good advice for all of us! 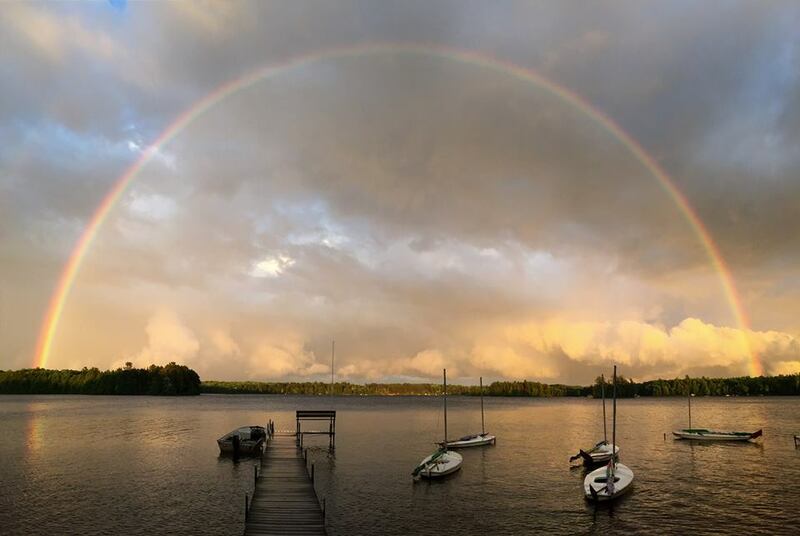 After a brief storm last night, this full double rainbow appeared over the lake! Well after yesterday’s crazy weather: wind, rain, beautiful hot sun, more wind, a storm and then a double rainbow (!! ), we’re glad today’s just plain perfect. It’s breezy enough for sailing (cabins 8, 12, 4, 1, 9, 11), but back bay is plenty calm for skiing (cabins 16, 8, 15, 10, 22, 3, 4, 1). It’s sunny and mild, perfect for land sports like baseball (17, 23, 13) and Ultimate Frisbee (4, 12, 1, 2, 22, 23). Honestly, you can’t go wrong! If you don’t know your son’s cabin number, then click here for the Cabin List. Boys started this great day off with a pancake breakfast. AND….tonight is TACO NIGHT. That means crazy costumes and a party vibe. Everyone loves taco night. But the big news of the day is that tonight’s game is all-camp capture the flag! Boys will get their Army/Navy assignment and play the game in two giant teams. The guys love this night! It’s hard to say goodbye to the ones we love. You know them. The army of iPhones, Androids, Kindles and Nooks. Oh how we’ll miss you. I love that. I love that Sally made a point to emphasize the positive impact of what we hope to accomplish by being “tech free.” I love that this older camper WILLINGLY brought his phone into the office to be held in safe-keeping for the season. And I love that we have upheld a tradition that goes back to the beginnings of the camping days. When Tracy and I started talking about it, we both came to the same conclusion. When Camp Highlands was established in 1904, their primary mission was to give boys, “a real, wilderness experience.” This was when the most cutting-edge technology in the city of Chicago was a gas-powered “Horseless Carriage.” This even predates things like the toaster, the radio and the theory of relativity. THAT was the world from which parents wanted their boys to escape. Can you imagine? Wouldn’t it be nice if we could all be so lucky? 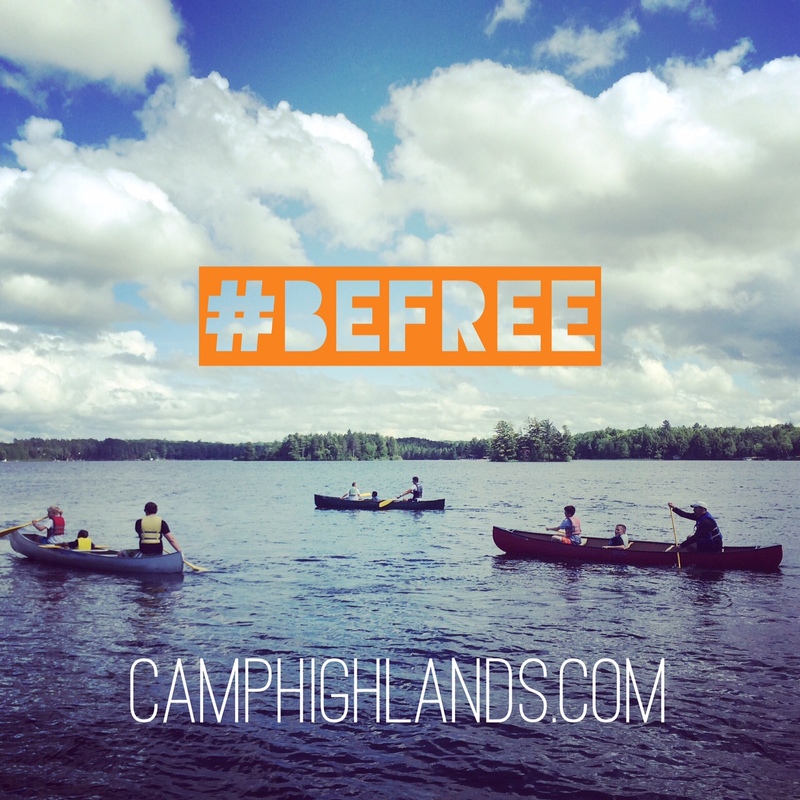 Camp Highlands has been in the business of providing young men and boys with real wilderness experiences that shape character and inspire self-discovery for 112 years. And we’ll take a pre-toaster world any day. I don’t think we could have ordered better weather for a first day of camp! It is gorgeous! All our boys made it to camp safe and sound. The busses rolled in around 5:00 to be met by our staff and campers that had arrived by car. 56 boys rolled off the bus, and staffers and campers grabbed their gear and the soccer field was emptied in about 10 minutes flat. Fantastic! Campers are getting their beds made and their footlockers squared away and in the meantime, 50+ lbs. of spaghetti are cooking. They’ll look forward to an awesome dinner of salad, spaghetti, garlic bread and fruit and cookies (nine-dozen!) for dessert. Tonight they’ll gather as divisions to get a lay of the land and discuss the general rules at camp. Of course they’ll eat s’mores around a fire. This is camp, people! These first moments of camp are some of my favorite. I wish I could bottle the excitement in the air. Boys are nervousexcitedscaredhappysadmostlyexcited. Highlands is an incredible place, filled with history and a special magic, but what gives this place a beating heart are YOUR boys. Today’s boys. We’re honored to have them here. We’d also like to send a special shout out to all the dads out there. Happy Father’s Day from all your friends at Camp Highlands. Don’t forget you can follow the fun on our gallery. The password is in the handbook and is also in the emails we’ve sent you. If you have trouble getting in, just let us know. P.S. I just want to point out that boys were thrilled to hand over their screens to us today. It’s like a relief for them! I wish someone would take my phone from me! I just wanted to introduce myself and let you know a few things about communication at Camp. My name is Tracy Bachmann. I am the person that you will be hearing from when you read our daily blog during camp. As a mom, I understand how important it is to feel connected! I’m in the office every day answering the phone, shepherding emails and making Camp Facebook updates. Communication is my passion! • If you’d like to email your son, we are now using a new email system through your CampMinder account. We sent a lengthy email about how to set this up earlier this week. Please call if you have any questions. P.S. I’ll be sending my 10 year old, Stella Plum, off to four weeks of camp in July for her third summer. I completely understand the mix of excitement and apprehension about shipping a child off to camp. So, seriously, if you’re worried, please call me! I can run recon for you and let you know how that boy of yours is doing!